Power Verbs is an experienced design firm with offices in Oakland, California. Our expertise in business, art, and programming enable us to produce compelling web sites for our clients. We have been working with the Internet since its early days, which gives us insight into how to best make your business successful on the Internet. Our primary focus is on your business needs. We listen to our clients and work as a team to develop an Internet strategy that works. Our approach focuses on our clients' customers as end-users. We produce engaging sites that integrate information, design and technology. The end-user finds what they are looking for quickly without long downloads. Our strategy brings customers back to the web site, helping our clients build relationships that are the key to a successful business. 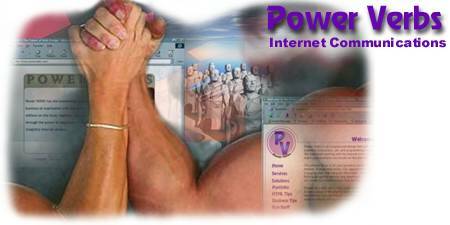 Producing a web site is only a part of the complete service Power Verbs provides. We grant assistance in every phase of the clients needs, from selecting the proper hardware and software, determining the best Internet Service Provider and Hosting service, to providing updates and maintenance. We are also easy to contact and quickly respond to our clients' questions and needs.